Wisdom teeth are the final set of molars that grow into our mouths, most commonly between the ages of 18 and 20. By the time these teeth are ready to erupt into the mouth, there are usually 28 adult teeth already present. If there is enough space for these final four teeth and they have developed in the proper position, they arrive healthy and are a valuable asset to the mouth. Commonly there is not enough space for these teeth to erupt in the proper way and they can become completely or partially stuck either under the soft tissue (gums) or hard tissue (bone). This is known as impaction of the wisdom teeth. Partially impacted teeth can be the most uncomfortable for patients. The area around partially impacted teeth is particularly difficult to clean and bacteria often will enter around the tooth. This can result in pain, swelling and infection. Partially erupted wisdom teeth are also more prone to tooth decay. The developing wisdom teeth are being evaluated each time a patient has x-rays taken at our office. If a pediatric dentist determines that the teeth are at risk for either partial or full impaction, the patient may be referred to an oral surgeon for a more formal evaluation of the teeth. If removal of the wisdom teeth is indicated, the procedure can be performed under local anesthesia, laughing gas, or general anesthesia according to patient preference and the recommendations of the oral surgeon. 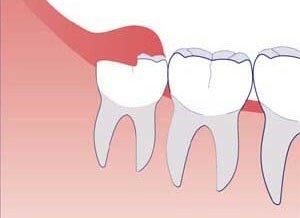 The amount of discomfort and time required for recovery after removal of the wisdom teeth is unique to each patient’s situation. If you have questions about wisdom teeth, make sure to ask at your next appointment.